MailUp launches MailUp 9, a completely redesigned version of the platform with new functions for automation and Email & SMS Marketing. Mailup tells us that a lot of effort has been spent in the overall UX, with many ongoing user tests and over 1.000 early adopters using the platform for several weeks before launching. Here is a video of Massimo Arrigoni, the CPO of MailUp showing and explaining the new platform changes. MailUp 9 offers a new interface with reorganization of functional areas and a new graphic redesign and look & feel of all its sections. A redesigned statistics dashboard provides data on the user’s latest campaigns, also from a mobile device. 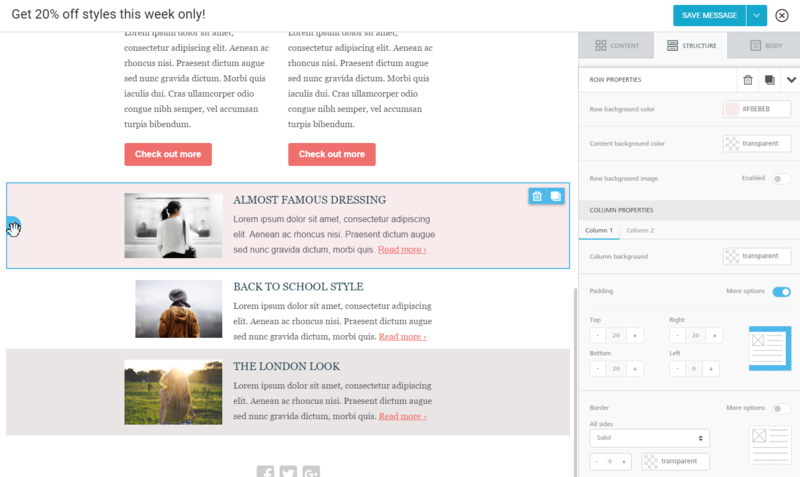 The lefthand sidebar navigation is something to separately mention, as it works quite smoothly. MailUp 9 introduces a new email creation tool called Collaboration. Team members can share the various stages of a campaign’s creation and pre-launch, allowing to add notes and comments to every aspect of the message. It makes it easy to co-create email campaigns with the members of your team: ask for sign-off, collect feedback and add notes on the email design and copy, without passwords to remember. Collaboration features are not often seen in Email Service Providers. It is especially geared towards Digital Agencies that plan campaigns for third parties, and for companies with a structured flow of approval. MailUp 9 uses the BEE drag & drop email editor. 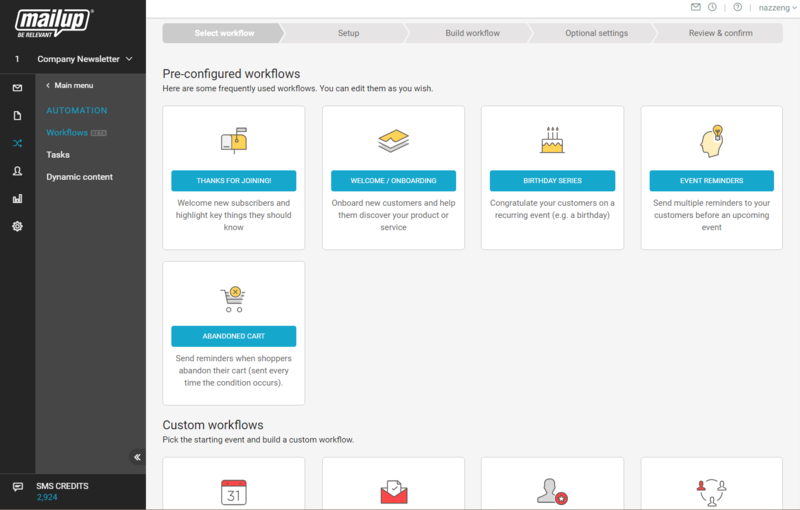 MailUp 9 introduces new features for the creation of Marketing Automation workflows. Automation in MailUp 9 works by dragging actions and messages onto a vertical line to build your automation flow. You can choose a trigger event, build the workflow to lastly set conditions and filters. 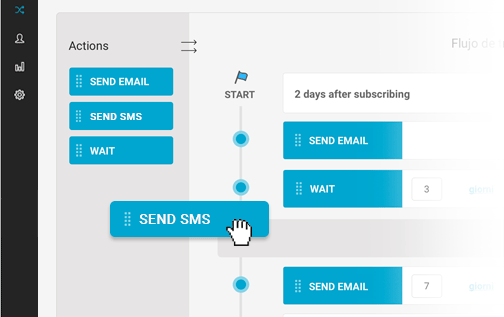 Platform users can now add SMS messages to emails, creating an automatic flow able to deliver multi-channel campaigns. There is also a new complementary feature that allows clicks on links contained in SMS messages to be tracked, not only at the campaign level but also for individual recipients. Some workflows come preconfigured / with examples, marketers can edit and use. The new version is readily available to all new customers, all current MailUp users will be automatically upgraded to the new version of the email software. Pricing remains the same. As far as the roadmap is concerned MailUp is aiming to build the perfect solution for messaging that can be easily plugged in other systems like Customer Journey Management and Omni-channel orchestration. Bigger additional could be “new channels”, like with Facebook Messenger. The new update after the release added the following improvements. The MailUp email and SMS delivery platform combines email marketing and automation tools with SMTP relay for transactional emails and plugins for e-commerce, CRM, and CMS systems.